Today I went through my filing boxes, organizing what needed to be organized, and discarding what was no longer needed. It was during this process that I happened upon a curious artifact… a curious artifact that has interesting implications in the history of Chainsaw Buffet. It would seem that the creative force that helped form the Buffet was at work years ago. It might not be surprising that my find will dredge up other memories from my colleagues, and they, too, will discover that their fates were intertwined with the legendary Chainsaw Buffet well before we ever conceived of this great site. As Tenacious D was destined to become the greatest band ever, were we too destined for greatness? Coincidence? Well, let me tell you my story. Then, you may decide. The Baker. An ineffective superhero? Yes. But look more closely. First, his resemblance to The Chef is uncanny. OK, well, that’s because I drew them both. But it is uncanny that over the years, such a similar character design resurfaced seemingly at random. Once I drew the picture, I gradually forgot of The Baker’s existence. Until now, that is. Second, the character’s name is “The Baker.” Now, granted, our propensity for naming characters based on jobs in a restaurant is equal parts pseudo-anonymity and hilarity. However, The Baker is clearly the only name for a superhero whose main power is being a baker. Yet, there it is–a character named with the same naming convention the Buffet would later adopt. Speaking of which, my memory is fuzzy on what The Baker’s powers actually were. I’m not sure he had any. As I said, I believe the discussion that prompted this sketch was about ineffective superheroes. Third… well, OK, I think those two items cover all the interesting coincidences–but they are coincidences you cannot deny! So, was the founding of the Buffet foreordained? I do not know. 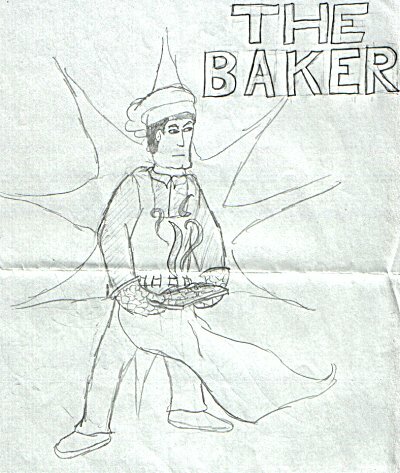 All I know, is that one day, many years ago, there emerged… THE BAKER. Posted in: Self-Referential Crap, The Maitre d': A Legacy of Failure on March 3, 2008 by The Maitre d'.